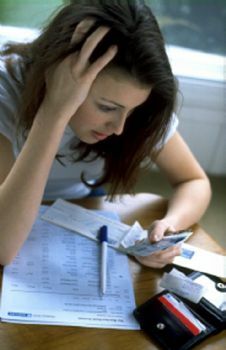 The amount of debt households have is still worrying many people, with credit card debt top of their list of concerns. With some cards charging high interest rates, it can take a long time to clear the debt. Are there any ways to reduce your credit card debt and what help is available if you can’t pay it off? According to the Infographic ‘Personal Debt in the UK’ 42% of adults in the UK are worried about the amount of debt they have. Among those polled in the research carried out by ComRes which features on the Infographic, 32% of people said debts accumulated on credit cards and store cards caused the most worry. Figures also released by a debt charity show that the average household now pays £189 a month on the interest on their debts. After they’ve paid for essential items, including food and utilities, this amounts to 22% of their income. The number of people with unmanageable debts has started to decline, probably partly due to the tougher restrictions on new applicants. However, according to Bank of England figures, in 2011 credit card companies still wrote off £3.64 billion in bad debts. This amounts to 7% of all outstanding debt. Credit cards are still the payment method of choice for many consumers, with 29.4 million card transactions taking place in April, which totalled £1.455 billion (Credit Action). How can you reduce your credit card debt? If you’ve got a large amount of debt on credit cards, it’s important to take control of the situation as soon as possible. The best way to approach this is to pay more than the minimum monthly amount. Otherwise you’ll be incurring large interest charges and doing little to reduce the overall balance. In fact, as the interest accumulates, the debt could become unmanageable and take years to clear. If you have more than one card, you should start to pay off more on the most expensive card first. Take a look at all the interest charges on your store and credit cards and prioritise those that are costing you the most. Once you’ve cleared one, start paying off extra on the next. Sometimes it can be too late to try and pay the debts off yourself and you need to opt for a more formal agreement. One option to deal with your unsecured debt, including credit cards, is to set up a Debt Management Plan. Through this you’ll consolidate all your debts and simply make one affordable monthly repayment. This amount will be distributed to all your creditors, who will be asked to freeze further interest and charges on the account. Alternatively, entering into an Individual Voluntary Agreement (IVA) might be the best option. It normally lasts for 5 years – during this time you will repay debts at a rate you can afford, interest and charges will be frozen and debts that still exist after this time will be written off. As more people become worried about their debts, particularly unsecured ones such as credit cards, it’s important to take control of the situation. If you have large debts, there are options available to help you pay them off. WARNING: Read This Before Consolidating Your Credit Cards! Thanks for sharing the info, never heard of IVA before, need to find out more about this service. I’d agree that paying down debt makes far more sense than saving in this environment. Great post. I think the most important point you touched on is to take action and positive action at that. So many people continue to spend and build debt even though they know they shouldn’t. We have to start being more proactive with debt situations rather than reactive. I would definitely agree that credit card debt is the most worrisome. Having that unsecured mess hanging over your head is terrible! I agree Laurie, it’s that horrible kind of debt that just sits there unless you consciously overpay to get rid of it. Exactly. Never use a credit card and avoid the whole headache.